The chart says it all. I graphed the inflation-adjusted S&P 500, using January 1991 = 0 as the base. Data courtesy of Robert Shiller (available for download here). 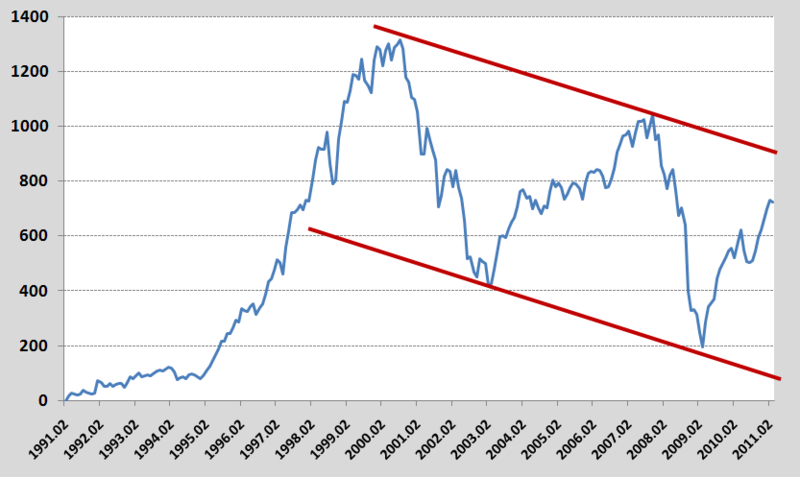 If the descending triple-top does not speak for itself, also bear in mind that the level of the S&P 500 is being deflated by the government-reported CPI, which is calculated with all those wacky hedonic adjustments, so the extent to which equity valuations have failed to keep up with inflation is actually understated by the graph. After inflation, the buy-and-hold investor has a portfolio that’s equal to its 1997 value. The Black Hole of Financialization Bearish Technicals in Gold: Is There an Entry Point Ahead?